If the events of the last few days have proved anything, it is that there are two entirely separate "leave" campaigns in progress. And we are not referring to Leave.EU and Vote Leave Ltd, but to a far greater distinction. Essentially, there is the establishment, led by the so-called eurosceptic "aristocracy" and there are us, the people – most of whom are not even aware that they are part of the campaign. The ironic thing is that the denizens of this establishment believe they are the campaign. So complete is that belief that they don't even think of themselves as the only campaign. That would imply that there could under some circumstances be two campaigns. Their mindset does not even conceive that anything not within their purview could ever exist. An extraordinary example of this came with Ruth Lea blithely telling British Influence that "we all agree … Norway is not the way". It was that arrogance that gave the game away – the assumption that what Ruth Lea believes necessarily applies to us all. The idea that someone could hold a contrary thought would not even enter her head. In exactly the same way, we had John Redwood declare, "Eurosceptics don't want the Norwegian model", again illustrating the overweening arrogance of this self-anointed aristocracy. Between them and us stands the "Norway Option" – the dividing line between those who are looking for an intelligent way out, and those who are driven by dogma and prestige and are intent more on securing their own agendas than they are on leaving the EU. 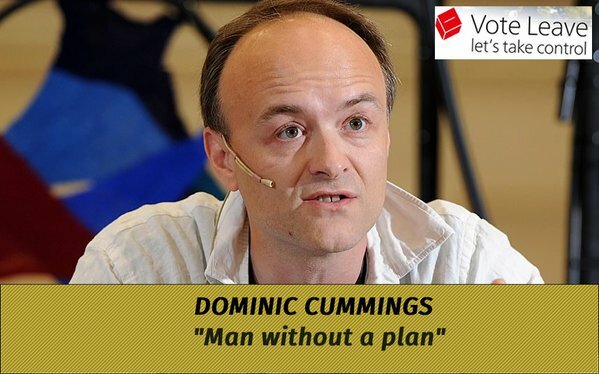 This is brought into focus with considerable clarity by Mr Brexit who points to the considerable confusion in the stance of Dominic Cummings- the man without a plan - and his unwillingness to make his intentions clear. But what is so utterly bizarre is that the "aristocracy" stands closer to the Europhiles than they do to us. This is not only in their rejection of the Norway Option, but also in their expressed desire for EU reform. Take a sanguine look at the European Movement, Open Europe and now Vote Leave Ltd, and you would find it hard to discern a difference between them. But, as Pete North observes, the Norway Option "is still go" and The Boiling Frog picks up the threads by looking at Iceland, which rejects the idea that the EEA is "ruled by fax". David Cameron, in opposing the Norway Option as an alternative to the EU is creating a straw man. This option is not the end game. It is an interim solution to the complex problem of extracting ourselves from over forty years of political and economic integration. Amazingly, the Eurosceptic "aristocracy" simply can't get their soggy little brains round the idea that it would be extremely unwise to attempt a "big bang" separation from the EU. They also have difficulty with the idea that the two year period allowed for the initial Article 50 exit negotiations isn't long enough to broker a bespoke free trade agreement – which can take 5-15 years to conclude. One might have thought that relatively intelligent people could comprehend these relatively simple concepts, but they seem to be totally beyond the scope of Ruth Lea, John Redwood, Dominic Cummings and many more of this ragged bunch. We have speculated many times on why this should be, but the behaviour seems inexplicable – a blunt, obdurate determination to look facts in the face and turn the other way. Yet there remains an absolute logic in deciding that, since we are already in the European Economic Area (EEA) – the basis of the Norway Option and the core of the Single Market – we should on leaving the EU maintain continuity by staying in the EEA, buying time for a considered, longer-term solution. As to the Norway Option, the Telegraph has been talking (at last) to the Norwegian No2EU campaign, which asserts that the Norwegians are happy, rich and free outside the EU. If we went the same route, our contributions to the EU – contrary to the Prime Minister's lies - would halve. We would gain a veto on new laws and benefit from "safeguard measures" which would enable us to suspend parts of the agreement if necessary (including free movement). We would take back control of our seats on world bodies, where most trade law is made, and we would cease to come under the jurisdiction of the European Court of Justice. Even as an interim solution, we would be better off in the EEA. Over the last few days, though, we have had input from numerous bloggers, including Mr Brexit, from White Wednesday, Independent Britain and even Civitas, which contributes a thoughtful piece. Yet nothing of this matters to the guardians of ignorance, the once-mighty Times. To us and the rest of the legacy media, we are invisible – we simply don't exist. As for Flexcit, it is as if it was trapped in the enchanted forest, where the text fades to invisibility when viewed by someone from the inner circle. Thus, from a position of profound ignorance that we so commonly associate with the legacy media these days, it trots out the propaganda and roundly declares on the undesirability of "entering a Norwegian-style halfway house". In common with the rest of its ilk, it then – with a lofty pompousness that would be almost comedic if it weren't so tragic – has the nerve to tell us that: "It is time then for both 'in' and 'out' campaigners in Britain to explain in more convincing detail how Britain would develop, and position itself in the world after a referendum". "Eurosceptics, Euro-realists: all now have a duty to present precise visions of how Britain should evolve in the next decade", it says. For a newspaper that cannot cope with the idea that we are "leave" and "remain" campaigners, there is a sinister motive to their wilful refusal to acknowledge Flexcit with its 30,000-plus readers. What we have here is the establishment attempting to "own" the referendum campaign. Between the legacy media and the self-appointed "Vote Leave Ltd", they want to frame the debate and exclude those of whom they do not approve. That is the main reason why there are two campaigns. The establishment-sanctioned effort excludes us, the people. We are invisible. In the collective establishment mind, we don't exist as sentient entities. On voting day, we become the cannon fodder, to do as we are bidden. But what none of these self-regarding, coprophagic parasites understand is the power of the internet. Through it the Norway Option lives on, unloved and unregarded by the establishment. But when we, the invisibles, take their citadels by storm and win this referendum, they won't even have seen us Cummings.